Online Ratings: Is rating the seller or the item more important? When you shop for items online, what is important to you? Perhaps you have noticed that many online stores show "customer" reviews of individual items. Some items that you shop for online need to be scrutinized to see if they are going to perform the way you expect. For instance, if I buy an electronics device which is complex, say a disc drive for my computer, I want to make sure that it hooks up and works as advertised, and that it does not fail in the first few months of use. So, it is helpful to see what people say about that. But, a hugely problematic issue with individual item ratings on most websites, is that they are so easily faked. There is no safeguard to prevent anyone, including the seller, from posting a number of positive reviews of a particular item. Does the seller honestly describe the items they sell on their website? If you call them with questions, will you get a knowledgeable and helpful person rather than someone who only works for an organization that is hired to answer the phone for an absent proprietor? Do they have a reasonable return policy? If you have a problem with the item or delivery, does the company care? If you need the item by a particular date, are you able to get someone to help you with that? If the item is customized with engraving or special sizing, are you confident it will be done correctly? Do they return phone calls and emails in a timely manner? How long have they been in business, and do they have a good reputation with their customers? Can you trust them with your credit card information and your money? The above issues relate to the quality of the selling company and are not particular to the item you are ordering. At the ViridianGold.com company, you will not find ratings of individual items. Taste in jewelry differs greatly from one person to the next, but everyone would agree on the importance of the above issues relating to the company who is selling the item. Also, the vast majority of customers do not bother to review an item they purchase, so out of the many thousands of items on our website, even if we offered a review option, only a very few items would show reviews. That is precisely the reason so many websites fake those item reviews! Instead, we show validated reviews that come from our actual customers. Since our store website is hosted by Yahoo Inc. Merchant Solutions, we show customer reviews that can only be obtained from customers who really purchased items from our store. Each of those reviews are prefaced by the words "By a ViridianGold.com customer via post-transaction survey". We are not able to edit or delete those reviews, so what you see are also unfiltered. Some customers only reply to the survey by giving us a rating on each of the five categories, and don't enter any written comments--these are counted as "ratings" and those who add comments are counted as "reviews." 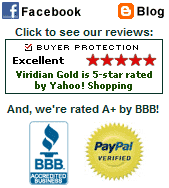 By checking those unedited ratings and reviews on our ViridianGold.com Ratings Page, you will find that our customers have had an overwhelmingly positive experience buying from us. These ratings are supplied to us by Yahoo Stores when our customers elect to submit a review form. We hope you will visit us at ViridianGold.com and experience not only our quality products, but also our outstanding customer service.